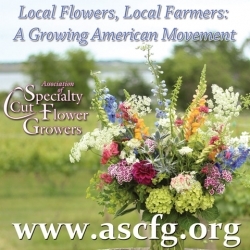 We are talking about American Flowers week, how you can be involved, and how you can support your local flower farmers. You'll learn the difference between growing from seed vs. planting from a garden center, and you'll receive tips on how to connect with flower farms & florists. Slow Flowers is an inclusive community dedicated to the promotion of American-grown flowers and the benefits of local, seasonal and sustainable sourcing. Members are engaged in all facets of the U.S. flower industry. The Slow Flowers mission is to change the flower sourcing practices of consumers and professionals through outreach and education, highlighting benefits of local, seasonal and domestic floral agriculture. The Slow Flowers Movement is a response to the disconnect between humans and flowers in the modern era. It aspires to reclaim the act of flower growing, recognizing it as a relevant and respected branch of American agriculture. Further, Slow Flowers connects consumers with the source of their flowers. When there is transparent origin labeling of all botanicals sold to consumers and professional florists, it heightens the value of local, seasonal and sustainably-grown flowers. Debra Prinzing is a Seattle-based writer, speaker and leading advocate for American Grown Flowers. Through her many Slow Flowers-branded projects, she has convened a national conversation that stimulates consumers and professionals alike to make conscious choices about their floral purchases. Not only is the she founder of Slow Flowers, she is also the creator of American Flowers Week. To read about Debra's many accomplishments, visit www.debraprinzing.com. To learn more about Slow Flowers, visit the Slow Flowers website, follow along on Instagram @dkprinzing and @myslowflowers, and listen to the Slow Flowers podcast.